Kafa (Adyghe: Къашъо; Kabardian: Къафэ) is a piece with (4:4) time signature, and usually this piece demonstrates the relationship between the Challa (male) and the Pshasha (female), this relationship which is built out of love, cooperation and strength. 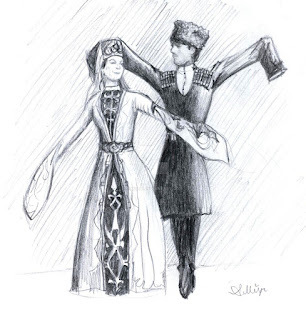 Usually 'Kafa' is the main piece to be played in a 'Djagu' (a Circassian dance party) and there are more than 100 kafas written by different Circassian artists. Wuig (Adyghe: Удж) is a piece with (8:4) time signature, and usually this piece is played before Challas are going to war, but nowadays it is played at the end of the Djagu and usually it follows this rhythm each eight time intervals a new musical phrase is introduced, and this piece may be repeated several times since more than ten different Wuigs are available. Tleperush is a dance which originates from the Black Sea coastal area. It is a piece with (4:4) time signature, and the word "Tleperush" means "leg kick" and usually this piece is faster than Kafa and Widj, almost equal in tempo to known "Lezginka" but different in style and follows this rhythm (1&2..3&4) and this rhythm is produced by Pshina and Pxachach and Pkhetaw (a wood hitting instrument for tempo). Abkhazians have this dance too, and they call it "Apsua Koshara"
Zefauk (Kabardian: Зэфакӏу) means "approach to each other". It is a piece with (4:4) time signature, and very similar to Kafa; the word "Zefauk" means (forward and backward) and it defines how it is danced by going 4 steps forward and another four backward exactly as the Kafa but with different musical taste. Shishan (Kabardian: Щэщэн) means "horse behaving". 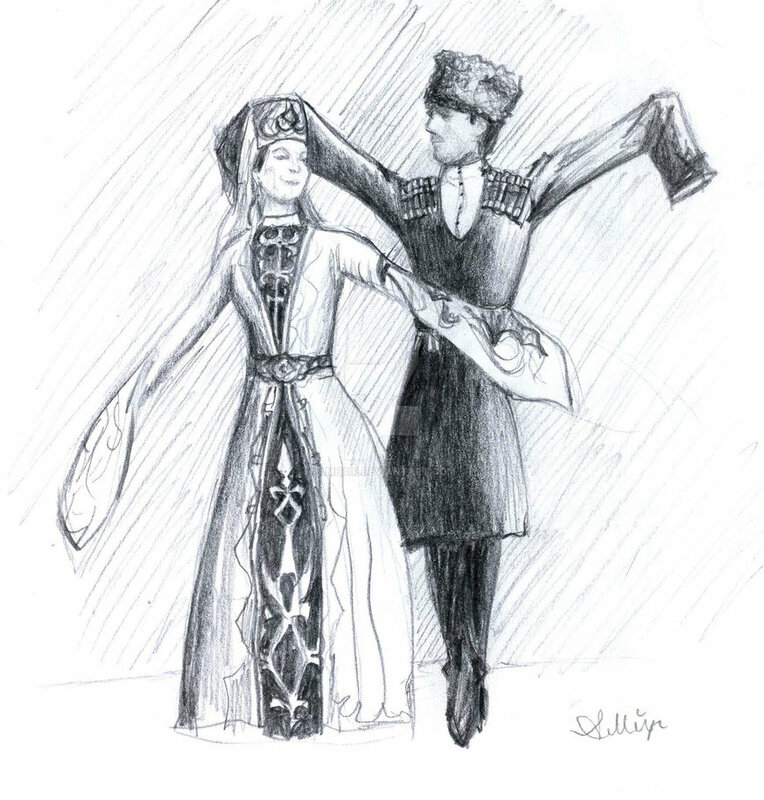 The dance is a fast piece with (4:4) time signature; this particular piece is played differently by pulling the Bellows of the Pshina in and out rapidly to create an Off Beat Rhythm which produces a Rhythm two times faster than its time signature, and the word shishan is a Circassian word and it is not linked to Chechen. Tlepechas is a fast dance and it is an improvisation dance it is considered to be one of the ancient dance of the Circassians, "Tlepechas" means "stick toes in the ground" the dance is based on the Nart sagas legends that used to dance on their toes. Zighalat (Russian: Загатлят) means "be the top". The dance is very energetic and fast, and it considered to be the fastest dance in the Caucasus. It is danced in pairs, in which the male dances fast and strong to show his skills, and the woman dances gentle but moves fast. Hakulash means "lame man move". At the beginning it was a joke and comedy dance to make the viewers laugh, but with time it became part of the Circassian repertoire; its leg moves look like lame moves but the dance is a fast dance. 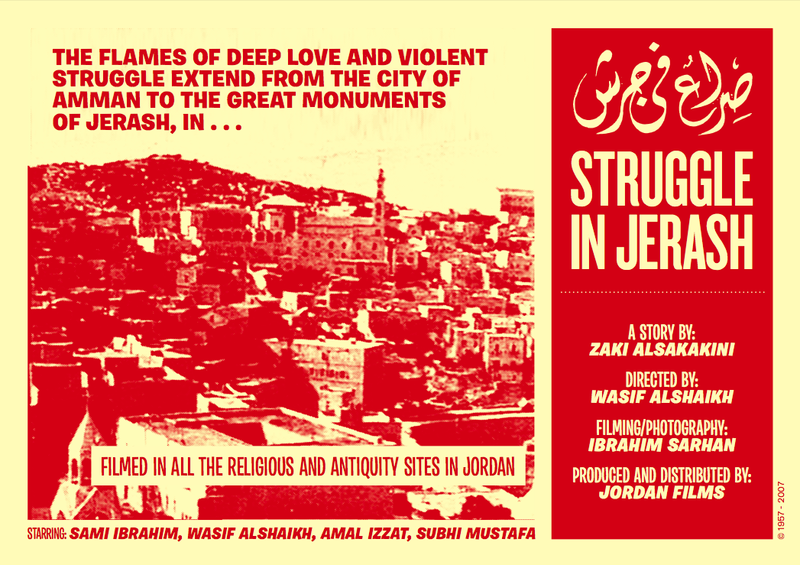 "Struggle in Jerash" was Jordan's first cinematographic film dates back to 1957. Until the creation of the Royal Film Commission in 2003, there were only 7 narrative feature-length films created in Jordan. 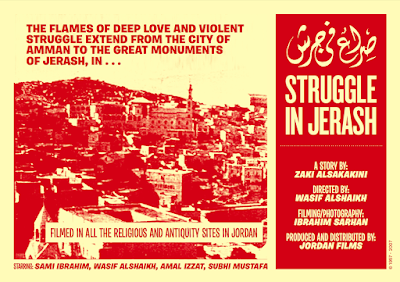 The number of Jordanian narrative feature-length films now are 24. Ilo Battigelli nasce a San Daniele del Friuli nel 1922. Si trasferisce giovanissimo a Santa Margherita Ligure, dove compie l’apprendistato presso lo studio dello zio Ernesto, noto fotografo, attivo dapprima in Friuli e, dopo la Grande Guerra, alla quale partecipa nelle squadre fotografiche dell’Esercito, in Liguria. 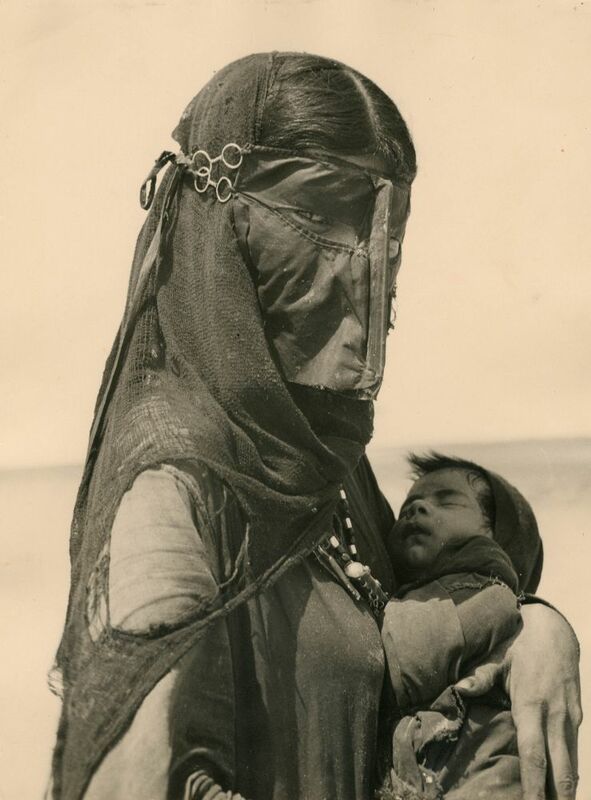 A sedici anni, dopo una breve parentesi come gestore, nella sua città natale, della succursale dello studio fotografico bujese Barnaba, Ilo raggiunge, con la madre ed i fratelli, il padre Marziale ad Asmara, in Eritrea, allora Africa Orientale Italiana. Il giovane fotografo friulano freelance collabora con il Corriere eritreo e la Compagnia Foto Milano. Gli eventi bellici lo vedono ancora in Eritrea, dove è trattenuto come prigioniero sino al 1946 quando, assieme a numerosi connazionali si trasferisce in Arabia Saudita, dove partecipa alla costruzione degli impianti petroliferi dell’ARAMCO a Ras Tannurah. Ed è proprio nel Golfo Persico che inizia l’epopea di Ilo il Pirata, lo pseudonimo da lui scelto e mantenuto durante tutta la sua vita di fotografo professionista. Degli otto anni di soggiorno in Arabia Saudita ci rimane una serie di rare immagini di paesaggio e una vasta galleria di ritratti, da quelli dei beduini a quelli dei governanti locali. Nel 1954 Ilo Battigelli lascia l’Arabia Saudita e inizia un lungo viaggio che lo porta in Terra Santa, in Medio Oriente, in Turchia, in Grecia, e, passando per l’Italia, negli Stati Uniti. Viaggio interrotto dalla notizia di una grave malattia della madre. Tornato in Italia, in Friuli e a Genova, dove lo zio Ernesto aveva nel frattempo trasferito la sua attività, Ilo sente però il richiamo dell’Africa e nel 1957 riprende la sua avventura trasferendosi a Salisbury in Rhodesia. Dopo un primo periodo di ambientamento, il Pirata viene messo sotto contratto dall’IMPRESIT che sul fiume Zambesi costruisce la diga di Kariba. Ilo non si limita a documentare il capolavoro di ingegneria idraulica ma, con grande sensibilità, entra nel mondo dei Tonga e fotografa la vita degli indigeni costretti a lasciare i loro villaggi poi inondati dal bacino della diga. A Salisbury, che ora si chiama Harare ed è la capitale dello Zimbabwe, Ilo apre nel 1960 uno studio che continua la sua attività sino al 1996.